During National Volunteer Appreciation Month, we are proud and honored to say, THANK YOU – to our amazing volunteers. Simply stated: we could not do it without you! Not only do our volunteers enhance the richness and diversity of services that we can provide to our program participants, but they actually increase the amount of services we can provide. For each hour that one of our volunteers mentors a young child, or supports an older adult in pro-social activities, or organizes our emergency food pantry – more scarce funds are going directly towards those in our community who need it most! Vicki Pace and Matthew Nichols, have chosen to dedicate their time to enhance the lives of Buckman youth, and we are so thankful that they have! Buckman Elementary SUN School’s choice for Honored Youth Volunteer is Matthew, an exemplary student who first volunteered as a Summerworks Intern (a job-readiness program for youth). “He has been an outstanding young person…and has continued volunteering with us and just keeps coming back. The kids all know him and feel comfortable around him.” Matthew has learned a great deal about program operations during his time volunteering with SUN. 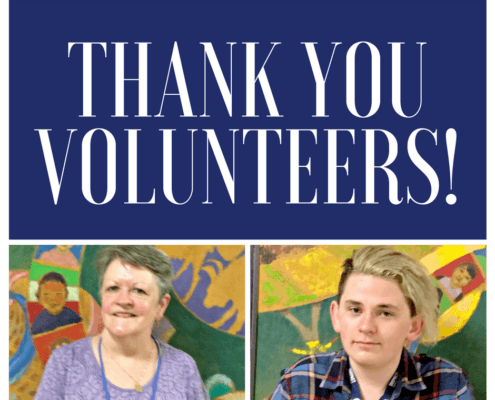 Volunteers, like Matthew and Vicki, are truly the heart of our organization and make an immeasurable impact on the people they work with, staff and program participants alike, transforming our shared community into a better, more inspiring place to live and work. Thank you again for sharing your time, talent and voice to make a difference in all of our lives! It Can Happen to Anyone – Jerome’s Story Stronger Through Partnership!